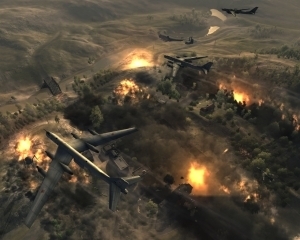 World in Conflict (commonly abbreviated WiC or WIC among players) is a real-time strategy video game developed by the Swedish video game company Massive Entertainment and published by Ubisoft (formerly Sierra Entertainment) for Microsoft Windows. The game was released in September 2007. 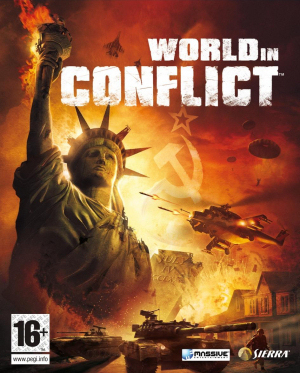 An expansion pack was released in March 2009 under the name World in Conflict: Soviet Assault; however, the console version has since been dropped from its productions by Activision and instead only exists as the expansion to the PC version. The game is set in 1989 during the social, political, and economic collapse of the Soviet Union. However, the title postulates an alternate history scenario where the Soviet Union pursued a course of war to remain in power. Ubisoft Entertainment (Euronext: UBI) (pronounced /ˈjuːbisɒft/ EW-bee-soft) is a French computer and video game publisher and developer with headquarters in Montreuil-sous-Bois, France. The company has facilities in over 20 countries, with studios in Toronto, Montreal and Quebec City, Canada; Bucharest, Romania; Barcelona, Spain; Shanghai, Chengdu, China; Singapore; Cary, North Carolina, USA; Düsseldorf, Germany; Sofia, Bulgaria; Casablanca, Morocco; Sydney, Australia; Milan, Italy; Pune, India; São Paulo, Brazil; and Libya amongst other locations. As of 2004, it was the third-largest independent video game publisher in Europe, and the seventh largest in the United States. Ubisoft's revenue for 2002-2003 was €453 million; for fiscal year 2003-2004, this grew to €508 million. As of 2005, Ubisoft employed more than 3,500 people, of which over 1,700 are classed as working in production. The company's largest development studio is Ubisoft Montreal, which in 2004 employed approximately 1,600 people. Yves Guillemot, a founding brother, was the chairman and CEO. As for 2008-2009, Ubisoft's revenue was €1,058 million, reaching the 1 billion euro milestone for the first time in its history.